Do you love to RV? Whether you’re a occasional traveler or a full-time RVer, there’s nothing quite like the freedom of being able to go wherever, whenever – while keeping the comforts of a home with you at all times. With all that said, there are some not-so-ideal things about RV life, too – like drinking nasty water from time to time! To ensure reliable access to clean, safe and tasty drinking water, you’ll want to invest in a water filter for RV use. 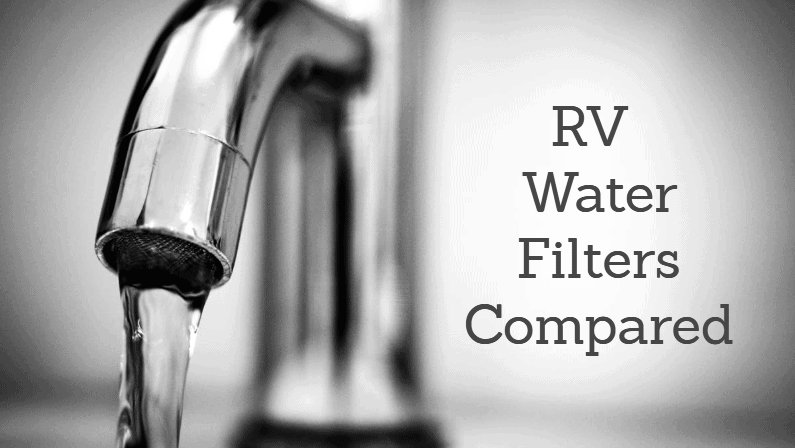 In this guide, we’ll help you find the best RV water filter on the market! When sourcing water from a series of RV parks, campsites and other locations, you’re sure to run into some less-than-ideal water at some point. And since space is limited in an RV, you don’t want to use a pitcher water filter or anything like that, as that would take up valuable space. The solution is to get a RV water filter system that’s specifically designed for RV use. We’ll show you how. The Culligan RVF-10 is a filtration system designed for RVers. It’s an external in-line system, which means it installs outside your RV, directly in between the water source and your water hose. This style is by far the easiest to install and use, and has the benefit of working on any style RV, without the worry of finding a place to install it. We picked this as the best filter for RVs because it checks all the boxes: it’s affordable, it’s easy, and it’s effective. The Culligan effectively improves taste and odor, reduces chlorine content, and removes sediment and contaminants. It has a reasonably long lifespan of 250 gallons, and is backed by a warranty. This is also a well-made, durable product. That’s important, considering this style of filter is placed outside your RV in all sorts of weather. Culligan is a trusted name in the filter world, and this product fits right in with some of their best. For folks looking for a budget-friendly option, the Camco TastePURE is the best RV water filter on the market. This unit is a top-seller on Amazon and elsewhere, and for good reason: It costs less than $20, yet does a great job of delivering consistently clean and tasty water to RVers. This is an inline filter that is designed to install temporarily directly between the water source and your water hose. It installs in about 1 minute, and is very compact for easy storage. It comes with a flexible hose mount that helps prevent kinking and makes it easier to attach to a variety of water sources. The filter uses a combination of activated carbon and KDF to reduce or remove bacteria, chlorine, carbon, minerals, odors, contaminants, particulates and sediment. It’s made in the USA, and has excellent ratings in RV water filter reviews. 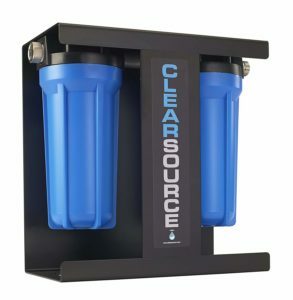 The Clearsource Premium RV Water Filter System is a high-end setup that is built to last. It has a dual-filter design for better filtration. The first filter, with a 5-micron rating, is designed to remove sediments and larger particles. The second, 0.5-micron filter removes chlorine, cysts, bacteria, volatile organic compounds, and other contaminants. This filter can be used in a couple of different ways. It’s designed to be set on the ground outside the RV, next to the water source. However, many users choose to install it on their RV permanently, instead of just attaching directly to the hose. Many people choose to install this unit somewhere in a holding bay, and run water hoses through it. Thus, it could take a bit more setup to use – but the results are well worth it. Internal vs External – You can get both internal and external RV water filters. 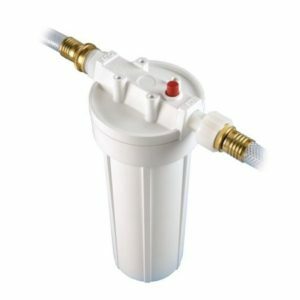 This refers to whether the filter setup will be installed inside the rig, permanently setup in your plumbing, or if it will attach outside your RV where you connect to a water source. Each have pros and cons, and different installation processes. Space Constraints – Think about where you would like to install your filter, and whether or not there is enough space for it to permanently install there. If you don’t have room, you’ll still be able to use a filter, you’ll just have to store it somewhere and attach it to your water source whenever you move locations. Beyond that, you’ll want to follow the RV water filter installation instructions that are included with your specific filter setup. The video below also does a good job of covering the basics. If you have some basic plumbing knowledge, you should be able to complete the setup on your own. If not, you may wish to hire an RV mechanic. For a skilled RV tech, this will be a quick job – but could still be costly due to service hour minimums. Contaminated Campground Water – Campgrounds and RV parks simply don’t have the same water infrastructure and testing regulations as residential neighborhoods do. Findings of contaminated campground water are fairly common. For instance, a campground was temporarily shut down after the extremely dangerous E. Coli bacteria was found in the well water. Inconsistent Water Supply – RVers who travel frequently will be tapping into new water supplies on a regular basis. The reality is that you just don’t know what the quality of the water is at each campground. It could be contaminated, over-treated, under-treated, or just plain gross tasting – or, it could be perfectly fine! But the fact is that RVers don’t have the luxury of everyday access to clean drinking water – unless they create that luxury by using a water filter. Water Flavor – Water quality and taste varies significantly throughout the world, and even from state to state. In some areas it just doesn’t taste very good. Even though it’s usually perfectly safe to drink, it’s unpleasant to drink – unless you filter it. Tank Maintenance & Cleaning – Filtering the water coming into your rig can help reduce the need for water tank cleaning and maintenance. By reducing the amount of sediment coming into your RV, you can protect internal components from damage and gunk buildup. You certainly still need to clean your tanks, but a filter can help increase the time between cleanings. 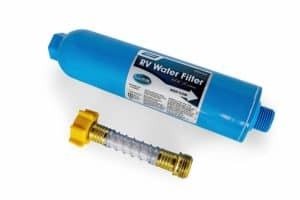 There are a lot of different RV water filtration options. So how did we choose the best RV water filter for our readers? Filtration Technology – Not all water filters are created equal. At WaterFilterData, we are committed to evaluating consumer products to help our readers make more informed choices. This includes evaluating the actual technology and design of various filters. Filter Style & RV Compatibility – There are lots of different styles of filters, but not all of them will work with RVs. For instance, reverse-osmosis setups are considered to be some of the most effective filters on the market – but good luck fitting them into an RV! We focused on models that would work well with RVs, and mostly chose filters specifically designed for RV use. Installation & Use – We focused on models that are easy to install and use. As you likely know, RV mechanics can be very expensive, with rates up to $180+ per hour. So, we wanted to stick to filters that our readers could install themselves. Value & Quality – And, of course, we sought to choose high quality, well-rated products that offer good value. In addition to research and testing, we evaluated third-party RV water filter reviews to get a broader data-set for our recommendations. Hopefully this guide gives you everything you need to find the best RV water filter for your rig. For further reading, check out our guide to the best water filters overall.